Click here to see the book on-line. Thanks Maria Ortiz for producing such a beautiful reminder! Stay tuned! 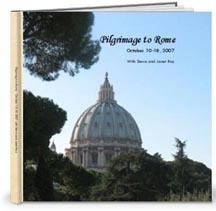 We are planning another trip to Rome in Spring 2010 when the Shroud of Turin is on display. We will also visit Padre Pio, Assisi, Milan, Eucharistic Miracles and Rome.